The term fever of unknown origin (FUO) is often overused in veterinary medicine, as the number of patients in which a true cause of fever cannot be uncovered is relatively small. When describing FUO in dogs, fever is usually defined as greater than 103.5°F to 104°F (39.7–40°C), with no duration of fever specified.3,4 In animals, the path to revealing the cause of persistent fever can be lengthy and expensive but, in most patients, an etiology can be eventually identified (see FUO in Animals: Often a Misnomer). Veterinary patients are often described incorrectly as having FUO when routine diagnostic testing—which can usually be completed over the course of a day—yields negative results. In these cases, the designation of FUO is often applied prematurely. The term should be reserved for patients in which no etiology is revealed after an extensive workup. Another commonly used, yet erroneous, criterion for defining FUO is a fever that does not respond to empiric antibiotics. A response to antibiotics does not prove a bacterial cause for fever because a transient response may be associated with an anti-inflammatory effect of the antibiotic or the waxing and waning course of disease. Thus, the cause of fever remains unknown. When a patient presents with an elevated temperature, it is important to distinguish from the outset whether the increase is due to fever or nonfebrile hyperthermia (see Is It Fever or Hyperthermia?). Most dogs that present with fever have some abnormality on physical examination that helps guide the diagnostic process. Abnormal findings that present with fever may include, among others, lymphadenomegaly, joint effusion, spinal or paraspinal pain or discomfort, low-grade cough, abnormal findings on thoracic auscultation, enlarged and painful prostate or swollen testicles in intact dogs, resistance to manipulation of the neck and head, red and swollen gums, or abdominal discomfort on palpation. Evaluation of identified abnormalities (such as an aspirate of an enlarged lymph node) fails to suggest a definitive disease process (eg, reactive lymph node). The veterinarian is then faced with the dilemma of determining which additional diagnostic tests to pursue, and pursuit of more advanced diagnostics can be curtailed by owner financial concerns that arise with high-cost/low-yield tests and owner compliance (or lack thereof). Is It Fever or Hyperthermia? Fever implies an internal resetting of the hypothalamic set point, whereas the elevated body temperature in hyperthermia results from outside causes. Many veterinarians have embarked on misguided diagnostic or therapeutic pathways due to the presumption that an elevated rectal temperature is associated with inflammatory disease. In my experience, it is not uncommon to see dogs with elevated rectal temperatures associated with anxiety, environmental conditions, exercise, drugs, and catheters/wraps. In fact, I have seen dogs that have presented with rectal temperatures in the 103°F to 104°F range (even as high as 105°F) as a consequence of anxiety. The presence of fever can be confirmed either by hospitalizing the dog for several hours or instructing the owner to take the dog’s temperature at home when the pet is relaxed. Likewise, when a dog that is being treated in the hospital for a noninflammatory disease suddenly develops an elevated rectal temperature but no other signs (eg, cough), the first step should be removal of tight bandages and removal/replacement of intravenous catheters before investigation for a nosocomial infection or other source of fever. A recently detected cardiac murmur can indicate bacterial endocarditis, although the murmur may be missed early in the course of disease. However, it is just as likely the murmur has been present and undetected for some time and is not part of the current febrile disease. Lameness can sometimes be uncovered by hyperflexing a limb; then having the dog walk immediately afterward. Fever may be seen with various cancers, most commonly lymphoma, leukemia, multiple myeloma, hepatic neoplasia, and necrotic tumor masses. One would expect hematologic abnormalities on the complete blood count (CBC), but these changes can often be subtle and/or misleading. Unexplained hematologic abnormalities should be viewed as an invitation to perform a bone marrow examination—aspiration or biopsy—which often yields a diagnosis. The initial diagnostic approach in a dog with unexplained fever should begin with signalment, patient history, physical examination, and laboratory diagnostics (see Diagnosing Fever: A Stepwise Approach). When the diagnosis is not readily apparent following the initial diagnostic approach, the clinician is faced with the option of a therapeutic trial or continued diagnostics. The goal of the therapeutic trial should be diagnosis (or, at least, elimination of a disease category); therefore, antibiotics should not be combined with antipyretics, such as nonsteroidal anti-inflammatory drugs (NSAIDs) or corticosteroids. Artificial resolution of fever due to antipyretic administration may improve the patient’s demeanor but is rarely required and tends to delay and confuse the diagnosis. Antibiotic selection is empiric and often based on prior experience or suspicions (eg, doxycycline in a dog with high tick exposure). Depending on the patient’s condition, most antibiotic trials are administered for 48 to 72 hours before declaring failure and considering either an alternate antibiotic choice or the next step in diagnostics. During this trial period, the patient can be stabilized with IV fluids and other supportive care, if required, or discharged to the client if relatively stable. Presuming there is no response to the therapeutic trial(s) and no distinctive localized findings to prompt more specific diagnostic tests, the next level of diagnostics should be pursued. Random cytologic sampling is often not valuable, but simple collections, such as peripheral lymph node aspirates, can be obtained easily. There are a variety of sites from which to sample, some more challenging than others, and diagnostics can include aspirates of apparently normal lymph nodes, joint taps, bone marrow aspirate, and cerebrospinal fluid (CSF) tap. Serology or PCR may be indicated for certain infectious diseases, and the specific selection of tests is often based on regional prevalence of such diseases. Abdominal radiographs and ultrasound (if available) are commonly pursued because it is difficult to palpate the abdomen in many dogs, especially those that are particularly deep chested. Abdominal radiographs are also important in the diagnosis of diskospondylitis. In the absence of identifiable abdominal pain or abnormalities on palpation, thoracic radiographs often have more value than abdominal radiographs. Computed tomography or magnetic resonance imaging of the brain rarely has value in the absence of neurologic abnormalities; CSF analysis has surprisingly greater benefit and is less expensive. The question that needs to be asked and answered at every step of the way is: Do I have reasonable information for a diagnosis and treatment plan? This question should always be re-evaluated just before and after an antibiotic trial (either failure or success). When the clinician has exhausted the diagnostics or, at least, reached a reasonable confidence level that infectious disease is not present and there is no evidence of neoplasia, the default diagnosis is immune-mediated fever. Corticosteroid trials must be administered appropriately; my protocol is to administer prednisone at 2 mg/kg Q 24 H (or 60 mg/M2 for larger dogs) for a minimum of 3 weeks (presuming the patient’s response is good), with gradual reduction by 25% every 3 to 4 weeks. If infectious disease is present, most dogs will deteriorate within 3 to 5 days of initiating a corticosteroid regimen. Three large retrospective studies of fever in dogs offer a valuable perspective on the outcome of diagnostic investigations into fever.3,4,14 Although the studies were conducted in Europe, where prevalence and type of infectious diseases may differ from those seen in the United States, the general findings are relevant across canine populations. Over the past 6 to 8 years, clinicians at Kansas State University Veterinary Health Center have identified more than 50 dogs with fever and a variety of clinical signs, including facial cellulitis, lymphadenomegaly, polyarthritis, hematologic abnormalities, hepatic enzyme elevation, and general malaise. The most common cytologic finding from aspirates of the affected organ or tissue in these patients was pyogranulomatous (sometimes just suppurative) inflammation with no visible organism. These findings led to a consideration of several diagnoses—fungal disease, systemic lupus erythematosus, or IMPA. However, the antinuclear antibody tests were negative and the polyarthropathy did not respond as expected to corticosteroids (although, often with very little detrimental effect other than the disease did not resolve completely). The pursuit of this disease as infectious began when a holiday delayed an exploratory surgery on a febrile dog with pyogranulomatous hepatitis (from a liver aspirate). The dog was serendipitously administered enrofloxacin and azithromycin and responded completely to this combination, with no surgery needed. Azithromycin, 5 mg/kg Q 24 H.
When dogs respond (eg, resolution or reduction of fever, cellulitis) to this antibiotic combination, they show dramatic improvement within 48 hours and the typical protocol is to proceed with a 6-week course; then carefully monitor the dog over the following 6 months for relapse. As with all antibiotic trials, if dogs do not respond within 72 hours, the trial should not be continued. Use of this antibiotic combination varies from other treatment recommendations for bartonellosis. Bartonellosis has been reported in dogs with fever and pyogranulomatous inflammation in various organs,15-18 and the investigation into the dogs at Kansas State University continues. Some veterinary professionals feel that ciprofloxacin has unpredictable absorption and pharmokinetics and, therefore, should not be used in dogs due to the results of a 2012 study.19 That study was conducted on 6 beagles that were fasted for 18 hours; 4 demonstrated high levels of absorption when administered ciprofloxacin, while 2 had poor absorption. A study comparing oral ciprofloxacin and norfloxacin in 4 beagles also noted inconsistent absorption of ciprofloxacin.20 In contrast, a 1990 study on 4 mixed breed dogs (range, 16.4–27.3 kg) did not demonstrate large variations in pharmacokinetic variables.21 Therefore, a study involving a larger number of dogs receiving ciprofloxacin in real-world conditions (ie, with food) is needed to understand the prevalence of variable absorption among dogs. The records of 217 dogs with fever were evaluated. The most common final diagnostic category was immune-mediated disease, which was present in 32% (69/217) of the dogs. This category included IMPA and SRMA, both of which commonly have localizing signs. When additional diagnostic tests were performed, presumably based on an abnormal finding on physical examination or routine screening laboratory tests (CBC, serum biochemistry profile, urinalysis), the diagnostic yield was fairly high. For instance, cytology (which was poorly defined in these studies but included aspirates of masses or enlarged lymph nodes, CSF or synovial fluid analysis, and evaluation of bronchoalveolar lavage samples) provided, or was crucial to, the diagnosis in 56% to 62% of the dogs, and bone marrow aspiration yielded a diagnosis in 64%. However, diagnostics that are often performed as screening tests and not always chosen based on a specific identified abnormality had a much lower yield. Radiographs revealed a diagnosis in 48% of patients (22/46 dogs) in the study by Dunn and Dunn3 but in only 9.5% and 3.3% of the patients in the studies by Battersby et al4 and Chervier et al,14 respectively. Likewise, abdominal ultrasonography, PCR testing for vector-borne disease, and serology for toxoplasmosis and neosporosis infrequently yielded a diagnosis.4 These methods failed to yield a diagnosis in 19/1013, 15/664, and 14/5014 dogs. Although an antibiotic trial is often recommended and frequently employed in the workup of fever, antibiotics should be administered only after target areas have been sampled (eg, blood, urine, or abdominal fluid for culture or PCR). It is important that no additional antimicrobials or anti-inflammatories that may confuse the interpretation of the response be administered concurrently. Uncovering the cause of fever in dogs is usually a straightforward process. 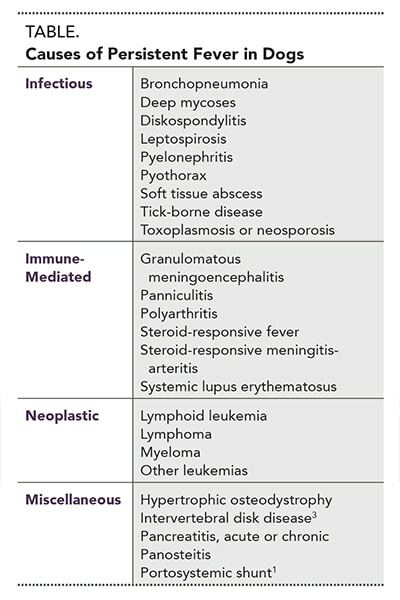 For those in which the etiology is not easily uncovered, however, an ordered and logical diagnostic and treatment protocol helps categorize the etiology (ie, infectious, immune-mediated, neoplastic)—even if the ultimate diagnosis is vague (eg, immune-mediated fever). Petersdorf RG, Beeson PB. Fever of unexplained origin: Report on 100 cases. Medicine 1961; 40:1-30. Cunha BA, Lortholary O, Cunha CB. Fever of unknown origin: A clinical approach. Amer J Med 2015; 128:1138e1-1138e15. Dunn KJ, Dunn JK. Diagnostic investigations in 101 dogs with pyrexia of unknown origin. J Small Anim Pract 1998; 39:574-580. Battersby IA, Murphy KF, Tasker S, et al. Retrospective study of fever in dogs: Laboratory testing, diagnoses and influence of prior treatment. J Small Anim Pract 2006; 47:370-376. Flier JS, Underhill LH. The neurological basis of fever. New Engl J Med 1994; 330(26):1880-1885. Burkert BA, Kerwin SC, Hosgood GL, et al. Signalment and clinical features of diskospondylitis in dogs: 513 cases (1980-2001). JAVMA 2005; 227(2):268-275. Harkin KR, Roshto YM, Sullivan JT. Clinical application of a polymerase chain reaction assay for diagnosis of leptospirosis in dogs. JAVMA 2003; 222:1224-1229. Bromel C, Sykes JE. Histoplasmosis in dogs and cats. Clin Tech Small Anim Pract 2005; 20:227-232. Graupmann-Kuzma A, Valentine BA, Shubitz LF, et al. Coccidioidomycosis in dogs and cats: A review. JAAHA 2008; 44:226-235. Bromel C, Sykes JE. Epidemiology, diagnosis, and treatment of blastomycosis in dogs and cats. Clin Tech Small Anim Pract 2005; 20:233-239. Rondeau MP, Walton RM, Bissett S, et al. Suppurative, nonseptic polyarthropathy in dogs. J Vet Intern Med 2005; 19:654-662. Safra N, Johnson EG, Lit L, et al. Clinical manifestations, response to treatment, and clinical outcome for Weimaraners with hypertrophic osteodystrophy: 53 cases (2009-2011). JAVMA 2013; 242(9):1260-1266. Hess RS, Saunders HM, Van Winkle TJ, et al. Clinical, clinicopathologic, radiographic, and ultrasonographic abnormalities in dogs with fatal acute pancreatitis: 70 cases (1986-1995). JAVMA 1998; 213:665-670. Chervier C, Chabanne L, Godde M, et al. Causes, diagnostic signs, and the utility of investigations of fever in dogs: 50 cases. Can Vet J 2012; 53:525-530. Drut A, Bublot I, Breitschwerdt EB, et al. Comparative microbioligical features of Bartonella henselae infection in a dog with fever of unknown origin and granulomatous lymphadenitis. Med Microbiol Immunol 2014; 203:85-91. Breitschwerdt E, Blann KR, Stebbins ME, et al. Clinicopathological abnormalities and treatment response in 24 dogs seroreactive to Bartonella vinsonii (berkhoffii) antigens. JAAHA 2004; 40:92-101. Friedenberg SG, Balakrishnan N, Guillaumin J, et al. Splenic vasculitis, thrombosis, and infarction in a febrile dog infected with Bartonella henselae. J Vet Emerg Crit Care 2015; 25(6):789-794. Tucker MD, Sellon RK, Tucker RL, et al. Bilateral mandibular pyogranulomatous lymphadenitis and pulmonary nodules in a dog with Bartonella henselae bacteremia. Can Vet J 2014; 55:970-974. Papich MG. Ciprofloxacin pharmacokinetics and oral absorption of generic ciprofloxacin tablets in dogs. Am J Vet Res 2012; 73(7):1085-1091. Albarellos GA, Montoya L, Waxman S, et al. Ciprofloxacin and norfloxacin pharmacokinetics and prostatic fluid penetration in dogs after multiple oral dosing. Vet J 2006; 172:334-339. Walker RD, Stein GE, Hauptmam JG, et al. Serum and tissue cage fluid concentrations of ciprofloxacin after oral administration of the drug to healthy dogs. Am J Vet Res 1990; 51(6):896-900. Purssell E, Collin J. Fever phobia: The impact of time and mortality—A systematic review and meta-analysis. Int J Nurs Stud 2016; 56:81-89. Kenneth R. Harkin, DVM, Diplomate ACVIM (Small Animal Internal Medicine), is a professor and head of the Section of Medicine in the College of Veterinary Medicine at Kansas State University. His research interests include infectious diseases and immunology, with a special interest in leptospirosis. He currently lectures on gastroenterology, hematology, hepatology, and neurology.